조재권, 김대권, 이문옥, 오태건,(2010).입자추적기법을 이용한 바다숲 조성지의 확장에 관한 수치예측.한국마린엔지니어링학회지,34(6),922-934. 바다숲 조성용 시설물의 효율적인 배치를 위하여 수치실험을 통하여 바다숲 조성 예정지의 조석류에 의한 해수흐름을 분석하였으며, 분석된 해수흐름을 바탕으로 하여 해조포자의 거동을 파악하기 위하여 입자추적실험을 수행하였다. 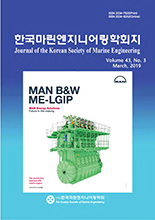 수치실험에 사용된 수치모형은 EFDC(Environmental Fluids Dynamics Code)를 사용하였으며, 연직방향으로 총 5개 층으로 나누어 실험을 수행하였다. 실험결과, 바다숲 조성대상해역의 해수흐름패턴은 대상해역 바깥쪽의 주류에 크게 영향을 받고 있음을 알 수 있었고, 잔차류를 분석한 결과 크게 두 개의 순환 고리가 형성되어 있음을 확인하였다. 해수흐름의 패턴을 고려하여 3곳의 바다숲 시설물의 설치장소를 선정하고 저층에 입자를 투입하여 15일간 추적을 실시한 결과, 1번과 3번 정점은 해안선에 연하여 띠형태로 시설하며, 2번 정점은 연안에서 약 300 ~ 500m정도 떨어진 곳에 타원의 형태로 시설하는 것이 보다 효율적일 것으로 판단되었다. To arrange artificial reefs for marine afforestation effectively, tidal currents were analyzed by numerical experiments, and particle tracking based on tidal currents was carried out to clarify the path of algae spores. The experiments were conducted by the Environmental Fluid Dynamics Code (EFDC), and water column was vertically divided into five layers. Tidal current patterns were showed to be affected by main currents outside of the study area, and two circle currents were observed during the analysis of residual currents. Particle tracking lasted 15 days at three installation places where artificial reefs for marine afforestation could be deployed. According to the results of the particle tracking experiment, particle movements at the No.1 and No. 3 stations were belt types along the coastal line. The No. 2 station documented an ellipse type movement 300~500m from coast line. These results suggest that artificial reefs for marine afforestation should be installed in the belt zones at of the No. 1 and No. 3 stations, and in the ellipse zone at the No. 2 station.